This is an experience of standing in spaciousness with your own power. You start to listen and act from your inner guidance. You start to acknowledge and accept that your Soul and ego are all part of you. They are here to reflect and steer you in the direction of flourishing. You feel so confident about your own actions and decisions that what others think or say no longer matter. You are having fun and have your daily matters taken care of. You get up of bed everyday knowing exactly what to do for the day. You feel present in your body. You start to connect and inspire others with ease (it all comes so naturally with ease!). You run your business or professional service with true consciousness and authenticity. You start to act from your inner strength and not external validation. You feel so fulfilled and contented, from within. Your heart feels light and flows with ease (some called it emotional freedom). Your relationship with yourself improves and so does your relationship with others. You are free from any pain (including the stress that's causing your shoulder pain) because you know how to take your stride with ease and wisdom. The new found clarity and vision set you on fire. You have the freedom to choose how luxurious, chic, eco, sustainable or simple your holiday, home, clothes and lifestyle to be! In short, you have the FREEDOM to live your HIGEST POTENTIAL and constantly become a BETTER VERSION of YOURSELF with JOY, PLEASURE & EASE! This is a program where we work together on a deeper and extensive level to DISCOVER, HEAL, RE-PROGRAM, SUPPORT, TRANSFORM and embark on the path to MANIFESTING the new you. Get in touch with your INNER WISDOM and start acting from your AUTHENTIC SOUL. GET TO KNOW YOUR SOUL-LEVEL GIFT AND START LEVERAGING IT IN YOUR LIFE, SO YOU CAN FLOW WITH EASE. Steer towards your next level of SELF-MASTERY whilst on your journey to ABUNDANCE AND & LIVING TO YOUR FULL POTENTIAL! 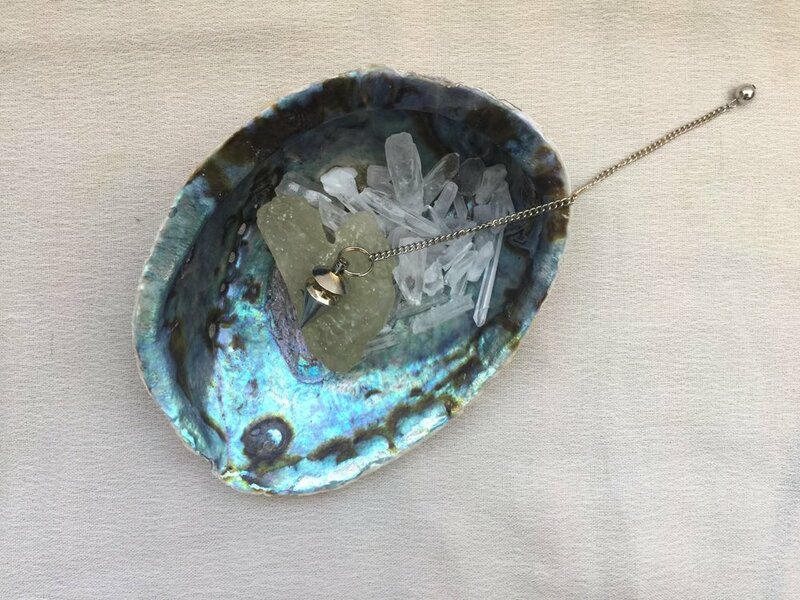 A CLARITY-ALIGN-MANIFEST session may include an integration of spirit guide coaching, Akashic Record, business energy alignment reading, oracle card reading, hypnotherapy to uncover and release negative beliefs, energetic healing, cleansing and re-energizing whenever necessary. Each session will leave you with greater clarity and connection with your Soul. More information will be provided upon your enrollment. Karin was able to pin point exactly the blocks I was struggling with. She helped me see the blocks and how to clear them. Also, she helped me become aware of my gifts. I'm clearer on my gifts and more confident with them. It was such a huge realization that what I thought I was weak at were actually mu gifts! I felt she was reading my mind! I am now clearer on actions I need to take and what I need to change. I am also experiencing a shift with lesser negative thoughts and reduced anxiety. 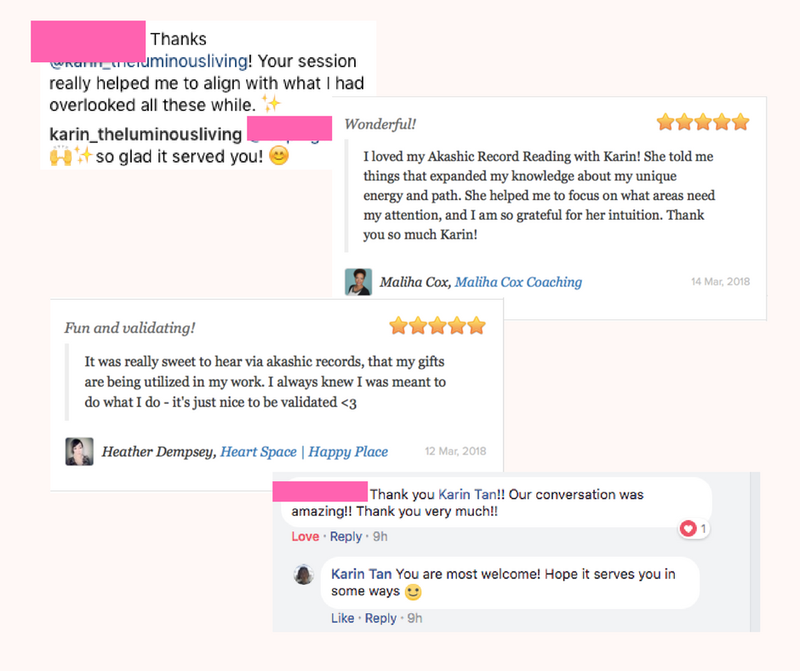 Overall, working with Karin has helped me to save alot of time from struggling alone. She gave me the important insights and action steps I can take to shift quickly. This has also allowed me to own my gifts! Payment plan available upon consultation.